Welcome to the very first Meezer Musings of 2014 and a very happy New Year! I hope you and the cats in your lives all enjoyed a fun, peaceful and safe festive season however and wherever you celebrated it. And a very special welcome if you've joined us in the last couple of months - there's no newsletter in December as it's always busy with holiday preparations. 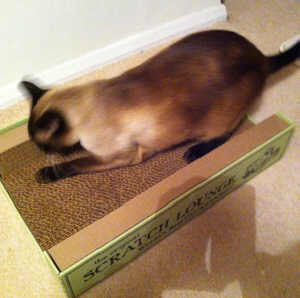 Bandit was lucky enough to be given a luxury cat scratcher for Christmas. If you haven't come across the Scratch Lounge, they're like a very sturdy cardboard box with three robust and reversible scratching surfaces made from corrugated cardboard. It's a great product, well-made and sturdy - the surfaces are reversible so you can turn them round once they're worn, and you can even buy replaceable pads. We liked it so much we thought you'd like to know about it too - it has great reviews from people saying how much their cats also loved it, and that it had saved many a piece of furniture from destruction! 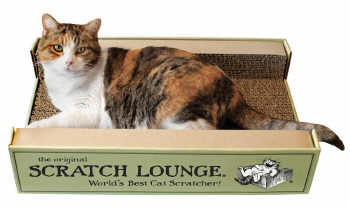 Sold on Amazon as The Original Scratch Lounge - The World's Best Cat Scratcher , these make a great gift for any cat-owner, or indeed, for any cat. Bandit gets to grips with his new Scratch Lounge! One of our Facebook visitors posted a question recently about Siamese dental health. "She had her 6 month check up today and the vet has advised that she has severe gum disease. Our poor baby has to have two or maybe more teeth out. The vet was shocked how quickly it has come on, although not surprised because of her breed. I had no idea this was common in Siamese and am feeling kinda like a bad mom". 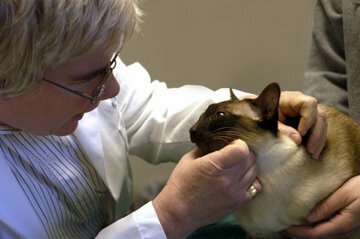 No-one needs to feel like a bad mom, but teeth and gum problems (gingivitis and periodontal disease) are sadly quite common in Siamese cats, and particularly in the Wedgehead or Modern type, perhaps because of the shape of their jaws. 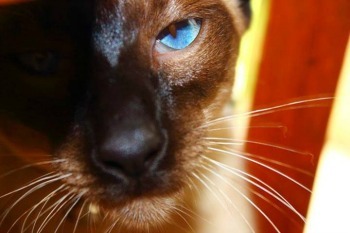 It can affect all types of Siamese cats though, so it's best to be vigilant. If caught early enough, regular dental cleaning by a vet or pet dentist will help keep the problem under control. A dry food diet (or the inclusion of at least some dry food) helps too, as crunching on the kibble removes plaque from the teeth. If the problem is more advanced the affected teeth will need to be removed, as left untreated diseased gums can lead to heart disease and even death. Brushing your cat's teeth (if they allow you to) with a cat toothbrush or finger brush can also help, as can using Plaque Off for Cats (Feline Formulation) in their food. We've been busy working behind the scenes on the website here, starting a series of changes and improvements which are due to happen gradually over the next year or so. If you're reading this on a PC or large screen, you won't notice anything different just yet. But if you're using a smartphone, you'll see that we now have a mobile-friendly version of the site, with pages fitting neatly and legibly into your phone screen. This is ongoing work, but our most popular pages have now been converted and the rest will be completed soon. We're also doing some work on the pages you made. These are being moved around to make them more accessible and easier to find. Because of this, the Submissions page is closed at the moment and consequently there's no 'Meezer of the Month' this month, but this feature will return to the site and the newsletter in the Spring. Posted by Christine Lock on our Facebook page, who could resist this gorgeous blue eye? Below you'll find details of cat shows coming up in the next couple of months in Australia, the States and the UK. Siamese cat legends - the lion and the monkey!